I recently attended a support group of sorts. It wasn’t technically labeled a support group, but it was a group of cancer patients, in a room, talking about issues surrounding a cancer diagnosis. It was kind of a lecture with some discussion thrown in here and there. I didn’t attend one support group while I was undergoing chemo and radiation. I know these groups are really helpful to many people. For me, my support group was my family, my friends, and the many wonderful people I met through writing this blog. I’m fortunate that I had a large network of people I could talk to and who offered to listen. I decided to attend this session because the topic at hand interested me and I figured it might be a good experiment, and might even help me in this whole “healing” and “recovery” process. To be honest, I didn’t get a whole lot out of the session. Everyone sitting in the circle was more than twice my age, and although we might have this cancer thing in common, that’s not really enough to make me feel connected to a bunch of senior citizens. (No offence to the many seniors who read this blog. I love old people and would love to sit around with you and play card games and yell at punk teenagers from the porch and do other old-people-things.) Being around a bunch of old people with cancer just reminds me of my crappy luck to have cancer in my 20’s and how much I just don’t belong and don’t want to be part of this particular group. The Cancer Club. As much as I can empathize with anyone who has cancer regardless of age, when I listened to this group talk about their experiences and feelings, I couldn’t help but think, You have lived long enough to have kids, and grandkids and a career. You’ve had an entire life that I have not lived. If someone told me I could have waited until I was 70 to get stuck with cancer, I would be jumping up and down and doing cartwheels. It’s almost like I am jealous of old people with cancer. Because as much as it is still awful, an old person with cancer just isn’t the same as a young person with cancer. It just ain’t. Besides that, the “teachings” in the session also felt very “Intro to Dealing With Cancer/Coping 101” kind of stuff. And as you might have noticed, I’m not exactly a cancer novice anymore. I suppose I was looking for something with a little more depth. A new way of thinking, or a different way of approaching things. The ideas and advice given were not new to me. It was all stuff I’ve heard before. However, it seemed that a lot of the folks in the group were really engaged and likely learned something new. I assume most of them were/are a lot less likely to use the internet to search for answers or to connect with others, so there is a much stronger need to have these types of group sessions. I think I was mostly alone in my feelings of I don’t belong here/get me out of here/why aren’t any snacks being offered to me right now/when can I go home and eat a snack. I’m happy the other patients could get this kind of much needed support. But unfortunately, for me, in a strange way, I just ended up feeling more alone, as if I had accidentally walked into the wrong room. A foreigner in a strange country. But really, that’s what it is to have cancer in your 20’s. It shouldn’t feel normal, because it is not normal. Young people shouldn’t be sick. They shouldn’t have to be part of a peer group where the majority of members have white hair (or no hair… although that part, I can relate to a bit more). But whether I like it or not, and whether I want to join them in their circle, or not — I do have this link to them, this bond that ties us all together. Regardless of age, we’re all scared, and we all want to escape the awful realities of a cancer diagnosis. And we’re all searching for a way to make sense of it all. 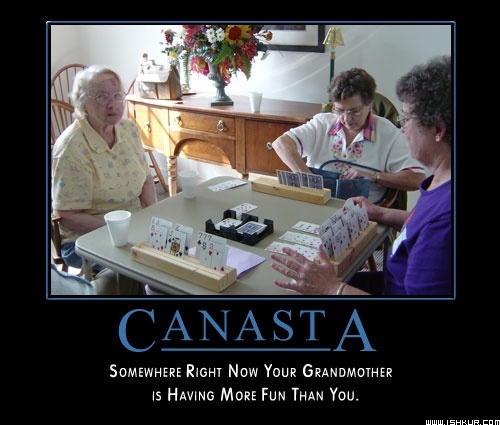 In the meantime, though, maybe it’s time to teach myself Canasta. If you can’t beat ’em, join ’em. Ahh, how I can relate! Definitely a defining feature of breast cancer, for me, is the fact that everyone is decades older. We are so precocious, breast cancer so young. I’m all for the young women support things, though often even there, they’re older younger women. So glad we’ve connected vis a vis the blogs. Sending love. I saw a senior citizen today. Gave me a bit of hope for having a long life. I like to think we are all cut from the same cloth and if they could survive wars and God knows what else. Maybe there’s a small chance for all of us. Stephanie – don’t feel you always have to write about cancer – except when you really want to or feel you must. I for one would love to hear more about how you are living your life beyond what you have been through the past few years (you have shared some – more would be great). You are such a delightful, observant, thoughtful and entertaining writer (yes, entertaining because your humour always shines through whatever the topic of the day), and I love to read what you write, and see your photos, whatever the topic! Thanks for sharing you with the world. Do not really know what to say because I know it is very annoying to hear things repeated. Only I remind you that there are many types of cancers, and the worst of them is the soul. This has no cure. The other, of course cause much suffering, especially for someone his age, but anyone with or without health has lifetime warranty. It is important to seize every moment. It’s all we have! Hug.